Convenient Locale. Easy Access. Functional Design. Natural Setting. 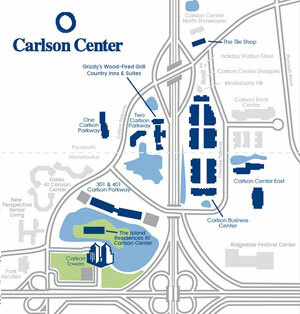 Carlson Center, Minnesota’s premier business park, has earned accolades for its mixed-use design. Easily accessible, the beautifully landscaped setting of lakes and wetlands complements flexible business space as well as multi-family residential property. Retail shops, restaurants, a healthcare facility and a hotel are architecturally integrated as well, creating an appealing and unique suburban campus. The 250-acre Carlson Center campus is located just eight miles west of downtown Minneapolis at the intersection of I-494 and I-394. Spanning the border between Minnetonka and Plymouth, two prominent suburbs, Carlson Center is near key business districts, desirable residential areas, Lake Minnetonka’s recreational opportunities and a wealth of fine dining and entertainment venues. 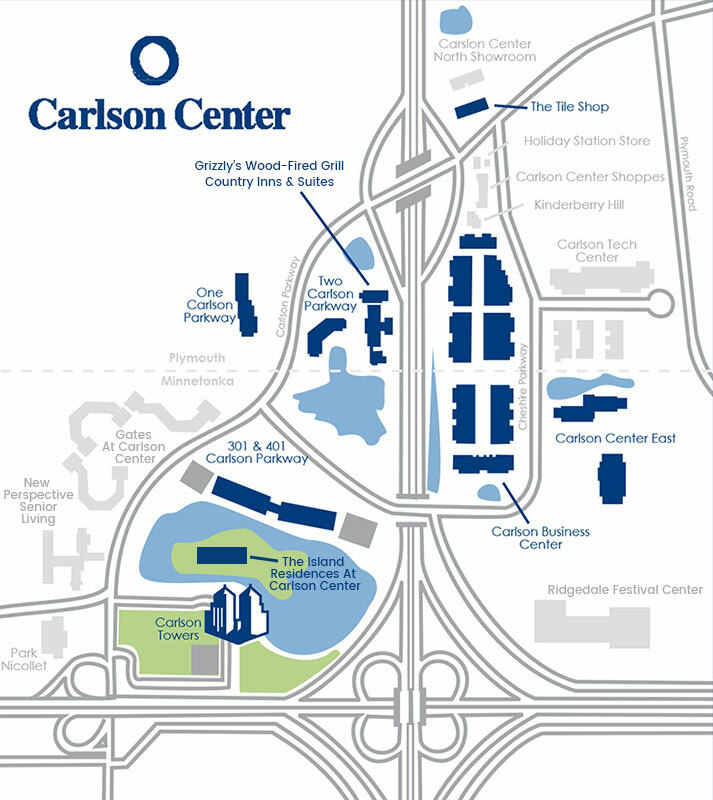 As the defining development of the western suburbs, Carlson Center is easily accessible by two main interchanges at I-394 and I-494. This unmatched accessibility makes the campus simple to find and equally quick and effortless to navigate. valuable amenities. Each building is designed to meet the unique needs of business tenants and residents as well as their guests. From comfort and space efficiency to energy management and advanced technology, these buildings demonstrate a rare mixture of form and function. Natural wetlands, serene lakes and manicured landscaping have been intentionally integrated into the design of the Carlson Center campus. These natural elements are important to the overall vision of the development. In addition to providing picturesque views from the office buildings and acres of habitat for the area’s wildlife, they also serve as a calming backdrop for relaxing walks along the many paths. 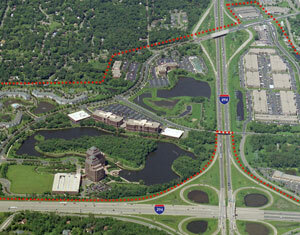 The Carlson Center bridges the city boundaries of Minnetonka and Plymouth, Minnesota. Carlson Real Estate Company developed strong working relationships with both municipalities, and more importantly, as the Center’s primary developer and owner, has worked continuously over the years to understand all sides of any issue and create solutions that satisfy everyone involved. 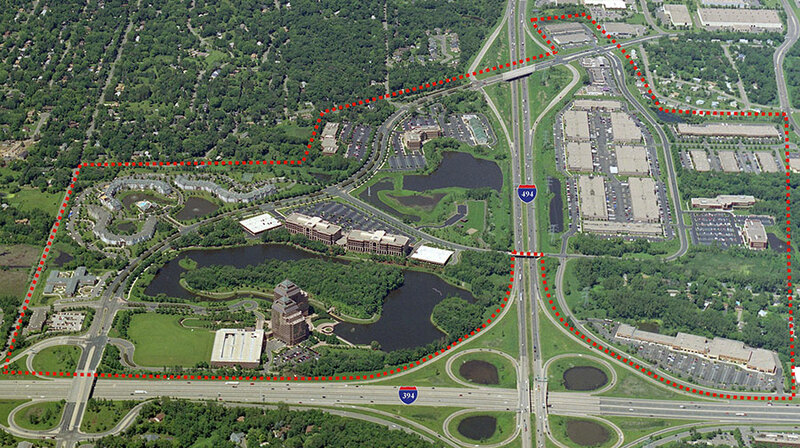 An aerial perspective highlights Carlson Center’s prestigious suburban Minneapolis location, unobstructed access to two main interstates, as well as the ease and flow of the development’s composition.